Alfa Romeo’s GTV is a storied nameplate if there ever was one. The GTV, which stands for “Gran Turismo Veloce,” or Fast Grand Touring, has been an Alfa Spider, an Alfa Giulia, an Alfa Alfetta, and a Spider again. And now it’s back with a lot of power. Or, in other words, it’s going to be a coupe. In case you couldn’t tell already from the faint single line on the side of the car, implying one (1) door per side. You know. Like a coupe. With two doors. That’s what coupes are. 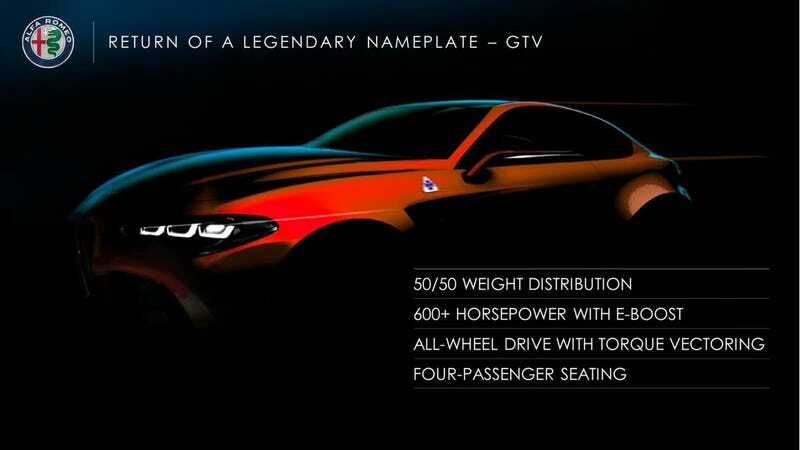 In fact, it looks remarkably like an Alfa Giulia coupe, and if we’re doing our math properly, it all sort of implies there’s going to be an Alfa GT as well, in addition to the GTV. Alfa’s got all the engines for a more down-market GT coupe to complement the GTV, complete with a range of four- and six-cylinder engines, after all. And we’ve got no problems with an Alfa Giulia coupe, seeing as how the Giulia is one of the best cars on sale today, when it works. Already we’re seeing this thing aimed at the BMW 8 Series and Polestar One. Not that we’re complaining. More on FCA’s plan as we get it.